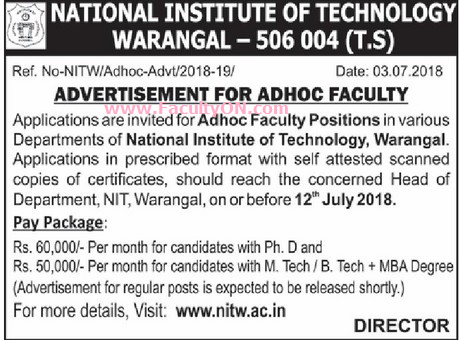 National Institute of Technology, Warangal has advertised in the EENADU newspaper for the recruitment of Teaching Faculty- Adhoc Faculty jobs vacancies. Interested and eligible job aspirants are requested to apply on or before 12th July 2017. Check out further more details below. About College: The National Institute of Technology, Warangal (abbreviated NIT Warangal or NITW) is a public engineering institution located in Warangal, India. It is recognised as an Institute of National Importance by the Government of India. Foundation stone for this institute was laid by then Prime Minister Jawaharlal Nehru on October 10, 1959, the first in the chain of 30 NITs (formerly known as RECs) in the country. The institute was renamed as the National Institute of Technology, Warangal in September 2002. Engineering: Ph. D / M. Tech. First class both at UG and PG levels. GATE qualified Candidates will be preferred. How to Apply: Interested and eligible candidates are requested to send applications in the prescribed format (enclosed) with scanned copies of certificates, should reach by E-mail to the concerned Head of the Department NIT, Warangal on or before 12th July 2018.